Japanese Episode DP 010: "Poketch Acquisition Difficulty!?" American Episode 474: "Not On MY Watch Ya Don't!" Our heroes have finally arrived in Kotobuki City! Hikari's first order of business is to obtain the Poketch, a useful device that almost every trainer in the region desires. Hikari finally finds a shop that sells the device, but the cashier tells her that they've all been recalled by the manufacturer! A downtrodden Hikari is upset until she comes across the Rocket-Dan (who are dressed as clowns) and is given a Poketch for free! While admiring her new item in a nearby park, Hikari is approached by a Kolink trainer named Teruhiko. The young boy tells the Coordinator that the Poketch is fake and reveals that his father is the man who invented the real thing! Hikari and the others pay a visit to Teruhiko's father and learn that the reason the Poketch was pulled from stores was because a bunch of counterfeits had entered the marketplace. That night, our heroes sleep in a nearby Pokemon Center when they notice a bunch of pokemon walking the streets as if in a trance! Satoshi-tachi follow the pokemon to a giant metal box that had been built by the Rocket-Dan. Our heroes determine that the fake Poketches had a transmitter in it that carried a hypnotizing rhythm capable of enslaving any pokemon who hears it! The Rocket-Dan make their escape, but Hikari's Mimirol is able to use its Ice Beam attack to bring their blimp crashing down to earth. The crash jolts the pokemon out of their trance, so they clear the way while Pikachu unleashes a final thunder attack. The Rocket-Dan are sent blasting off again, allowing the pokemon to return to their trainers. Later, Teruhiko's father gives Hikari a real Poketch for all her hard work, much to the Coordinator's delight. 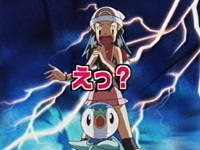 Now that Hikari has her highly coveted Poketch, she feels confident that she will do well in the Kotobuki Pokemon Contest. So this episode starts the trend of playing a part of the episode from later on during the cold opening. A lot of people were confused and angry, and a lot of people were blaming PUSA for repeating the footage. The thing is...this was done in the Japanese version as well. A lot of people see this footage as a waste of the first two or three minutes, but I see it as the directors trying to do something different. After 400+ episodes with the same director, you start looking for ways to experiment with the format of the show. Or maybe the fans over in Japan complained. The show didn't even start having a cold opening in Japan until "Psychic vs. Ghost! The Midnight Duel!?" so I'll bet a lot of fans missed the first part of the episode during those first few weeks. Could an angry fan have written a letter that caused the anime producers to treat this opening footage as expendable material? Who knows? As for the episode itself, it was alright in a "Stairway to Devon" sort of way. The Poketch ends up being the most useless plot device ever since we'll never really see it again, but people love this episode anyway since it features something from the games. And, y'know, that somehow makes everything better. The other thing people love is Marina's cameo, and as cool as that is, it's not that great a thing. If I had to choose a favorite part of the episode, it'd have to be the part where Satoshi lunges forward to catch Pikachu and actually misses, causing the mouse pokemon to kind of bounce off the ground like a rubber toy. It's just too unintentionally hilarious not to laugh. Sarah Natochenny still has trouble with making Ash laugh (check out the scene at the office when Landis talks about how cool Ash is for challenging the Sinnoh League), but the rest of the voice acting is ok. Though I couldn't help but laugh at the president's hilariously awkward "attack move" lines. Just...find another term to use. Please. Tyltalis keeps its Japanese voice. Three seconds are added to the TBC screen. I'll let you take a wild guess what TBC stands for.